Tonight, Rhizome will host an event called "Who Owns Digital Social Memory?" at 7pm in the New Museum auditorium and on livestream. The event is inspired by Rhizome's Webrecorder project, which aims to give users and organizations the tools they need to create stable, high-fidelity archives of the dynamic web. In preparation for tonight's event, Rhizome's Digital Conservation team has created an archive of the Instagram account @veteranas_and_rucas, which documents the SoCal Chicano party crew scene in the ‘90s. The project is supported mostly by users who submit their own photos of their lives from the ‘90s or earlier. 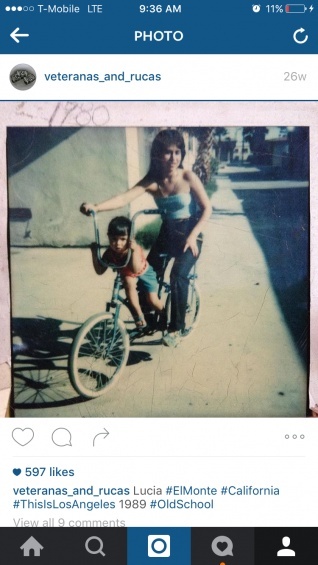 The fact that the Chicano scene was tight-knit has made the Instagram project a growing archive of family histories and a site for the activation of memory and culture. In fact, many users have renewed ties with family and friends in the comments surrounding each post. If "social memory" can be defined as "how and what social groups remember," then digital culture, as Richard Rinehart and Jon Ippolito point out, changes both the how and the what of social memory. What is remembered must now include a wide range of new kinds of web-specific cultural practices (link curation, vlogging, web searches); how it is remembered is often mediated by social media platforms, and increasingly in informal settings outside of traditional memory institutions. Social memory happens partly inside us, but also outside of us–in other people, and in a broader milieu, which now includes social media platforms. @veteranas_and_rucas is the ideal illustration of the stakes of this shift. It recirculates photographs that would otherwise be forgotten–these photographs were not found in any institutional archive–and it provides a context for the elaboration of memory around these images. This archive is maintained by artist Guadalupe Rosales, but it depends entirely on services currently provided for free by Instagram. In its archived version, viewable here, the material aspects of this project have been preserved independently of Instagram's servers, but the larger process of social memory that the project fosters cannot be captured by Webrecorder. @veteranas_and_rucas will be included in the forthcoming Artbase Collection, "Artist-Made Web Archives."